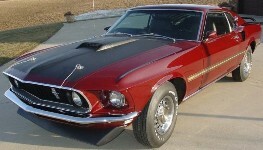 The 1969 Mustang Mach 1 (starting at $733 over the base V8 fastback or "SportsRoof" body) came standard with a matte black hood, hood scoop (only functional with the SCJ Ram Air Drag Pack engine), exposed NASCAR-style hood lock pins (could be deleted), a spoiler (at extra cost), reflective side and rear stripes, color-keyed sport mirrors, special handling suspension, and chrome exhaust tips. In the interior the Mach 1 came standard with high-back seats, black carpets, a Rim-Blow steering wheel, center console, clock, sound-deadening insulation, and teakwood grained trim on the doors/dash/console. 1969 Mach 1 Mustang fastback painted its original Candyapple Red. It has a 351ci engine connected to a 4-speed manual transmission and a 3.50 traction lock rear end. This 1969 Mach 1 Mustang fastback was driven by drag racer, Jim McCormick. He set many NHRA records for the Fastest Factory Street Stock with this car. It ran 10 second quarter miles. The car still has the original engine and running gear used to set those records. 1969 Mach-1 mustang fastback painted Gulfstream Aqua. This Mach-1 has the 390ci V8 engine, 4-speed manual transmission, and a 3.25 rear. These car have some of the largest chin spoilers. You could plow snow with them. Silver Jade 1969 Mustang Mach 1 fastback with blackened hood treatment and a 425hp, 1965 Ford Galaxy 427 cubic inch V8 engine. This beautifully restored car was featured Attitude Of The Week for 11-25-2007. This amazing Pastel Gray 1969 Mustang Mach 1 fastback was part of Emmanuel Theux's collection in 2008 and is now in the north west of France. This Mach 1 has the H-code, 250hp, 351ci, V8 engine and is our Attitude Of The Week for May 10th, 2009. Emmanuel says that this car was sold new to a US Marine who had to return it to the dealer after having troubles with the payment. It was then sold to a Swiss man in 1970, who was living in the states. Emmanuel says he bought it and brought it to Switzerland then sold it in Geneva after owning it for a year in 2008. It is a very complete car, matching numbers with the original body buck tag in the engine compartment. Pastel Gray is so light that it is almost white; and this car looks great with its red Mach1 side stripe and black hood, front air dam, rear window louvers or sport slats, and rear spoiler. Royal Maroon 1969 Mustang Mach 1 fastback with blackout hood and a 335hp (5200rpm), 428 cubic inch, 4 barrel, Cobra Jet V8 engine. This Mach1 has been restored with its original exterior color combination. Black 1969 Mustang Mach-1 fastback owned by Phil Phillips from Tulsa, Oklahoma. This was our featured "Attitude Of The Week for the week starting March 21, 2010. Phil says, "I bought this car in 2000. Had a little body work to remove some rusted areas. Had it custom painted later that same year." Indian Fire Red 1969 Mustang Mach 1 fastback with a 360hp (5400rpm), 428 cubic inch, 4 barrel, Cobra Jet V8 engine. Only one engine offering was larger, the Boss 375hp, 429ci V8. The door data tag on this car reads 63C for the Mach 1 fastback body style, Y5 Indian Fire Red - Ford #3202-A exterior paint, 3W white Clarion knit vinyl Mach 1 high bucket seats, 09M assembled on December 9th 1968, 65 order in Oklahoma area, 6 3.00:1 ratio standard rear axle, U C-6 Cruise-O-Matic automatic transmission. Candy Apple Red 1969 Mustang Mach 1 fastback with a 290hp (at 4800rpm), 351 cubic inch, 4 barrel V8 engine. Black Jade 1969 Mustang Mach 1 fastback with a 360hp (at 5400rpm), 428 cubic inch, 4 barrel, Super Cobra Jet V8 engine. Candy Apple Red 1969 Mach 1 Mustang fastback owned by Frank Hoover from Levittown, Pennsylvania. This was our featured Attitude Of The Week for the week starting January 23, 2011. It's an original R-code 428ci Cobra Jet car. Frank tells us more, "I bought this car in 2001. Originally I wanted a red 1968 428 fastback (which are hard to find). I was ready to buy one in Ohio from a dealer but by the time I got there the car was already sold. Two weeks later I found out about this Mach 1. I knew when I saw it on the showroom floor I wanted it. It was delivered two weeks later and I have been enjoying it ever since. This is an R-code 1969 Candy Apple Red 428CJ 4-speed shaker car. It has manual steering but it has power brakes which is needed - it is easy to spin this car sideways with the power it has. I have driven to car shows and even attended the Mustang Club of America shows and took Silver in the Concourse Class as well as Best Of Show in many local shows." Black Jade 1969 Mach 1 Mustang fastback owned by Redbud from Missouri. This was our featured Attitude Of The Week for the week starting November 28, 2010. This Mach 1 has its original 351ci 4v engine and a manual transmission. Redbud adds, "The car is all original, a true survivor with only 35k miles." 1969 Mach 1 Mustang fastback owned by Richard Kiggins from Pocatello, Idaho. This was our featured Attitude Of The Week for the week starting March 20, 2011. Richard tells us more, "I am the third (told by seller) owner of this original 390, 4 speed car. It was repainted in 1993 in Rio Red - the color was picked by the last owner. The seller I purchased this car from never titled the car - it sat in a garage or barn for several years. Originally it was Candy Apple Red with a red interior, and had the black out hood paint. It was ordered with a tach dash and the console, but not the fold down back seat." Indian Fire Red 1969 Mustang Mach 1 fastback with a 360hp (at 5400rpm), 428ci, 4 barrel, Ram Air induction V8 engine (Drag Pack option); white interior; and Magnum 500 rims, 15 x 7 up front and 15 x 8 in the rear with Goodyear Eagle tires. The Mach 1 in 1969 came standard with a matte black hood, hood scoop (only functional with the SCJ Ram Air Drag Pack engine), exposed NASCAR-style hood lock pins (could be deleted), a spoiler (at extra cost), reflective side and rear stripes, color-keyed sport mirrors, special handling suspension, and chrome exhaust tips. Aztec Aqua 1969 Mach 1 Mustang fastback owned by Richard Ellis from Gilbert, West Virginia. It has a manual transmission and it's original 302ci V8 engine. Richard's daughter, Beth, sent the photo and adds, "This is my father's pride and joy. He purchased it new and has recently restored it to it's original grandeur. It has only 30,000 original miles. The only thing he lacks is the stripes and he is working on that now. Would love to hear from anyone else who has the same model or knows anyone who does." Check out this awesome Royal Maroon 1969 Mustang Mach 1 fastback! Martyn is selling this for a client. This Mach 1 has it all; 390ci V8 engine, 4bbl Autolite carburetor, air grabber air cleaner, power steering, power front disc brakes, a/c present but in-op presently, new radiator, standard cooling, C6 3-speed automatic, bucket seats, console shift, woodgrain trim package, AM radio, chrome Magnum 500 wheels, 9-inch Ford rear, dual exhaust with glass packs, rear window louvers, pop-out quarter windows, front and rear spoilers, hood pins, hood integrated turn signals, and more. Royal Maroon 1969 Mustang Mach 1 fastback with a 335hp (at 5200rpm), 428ci, 4 barrel, Cobra Jet, V8 engine. This is Sue Coning's Wimbledon White 1969 Mach 1 Mustang fastback. This Mach 1 has the chrome Magnum 500 wheels and the blacked out hood. Sue also owns a Performance White 2008 Warriors in Pink Mustang coupe. Meadowlark Yellow 1969 Mustang Mach 1 fastback with a 290hp (at 4800rpm), 351ci, 4 barrel, V8 engine. Special Order Yellow 1969 Mustang Mach 1 fastback with a 360hp (at 5400rpm), 428 cubic inch, 4 barrel, Super Cobra Jet, V8 engine. This restored car is one of the 10 special paint cars ordered by Russ Davis Ford, Covina California for a special promotion. We are hunting through the newspapers of the time to determine what the promotion was. It could have been a 1969 carry-over of the "Rainbow of Colors" West Coast Promotion, or a "Gas Ronda" special promotion. The Rainbow of Colors promotion offered new Mustang owners one of up to 13 special "Rainbow of Colors." This car has been repainted Ford Special Paint WT6135, which a a little more orange than what we believe is the original Yellow in this group of 13 colors. But WT6135 is a period Ford special order paint! This combined with some newspaper articles of the time says that funny car racer Gas Ronda was heavily sponsored by Russ Davis in 1969 and Gas Ronda drove a modified bright "orangey reddish" Mustang Mach 1. It is possible that the 10 special colored 1969 Mach 1 Mustangs ordered by Russ Davis was for a Gas Ronda promotion. In this case a brighter yellow car may have been necessary, making the current color possibly very close to the original. What did the other 9 Mach 1 Mustangs ordered by Russ Davis look like? well here is one. This is a Beatnik Blue 1969 Rainbow Of Colors Mach 1 Mustang fastback. This special edition was purchased new in Torrence, California. This Mach 1 has a 351ci V8 engine, 4-speed Top Loader with Hurst shifter, 10 spline clutch kit, stainless steel racing flywheel, 9-inch rearend, dual exhaust, front disc brakes, and Deluxe interior. This Mach 1 has a DSO of 72-5016. The paint code is a 5 - which is really a blank followed by a 5. The 5 is for the factory blacked out hood. Special order orange 1969 Mach 1 Mustang fastback owned by Mark. This car still wears it's original orange paint. It has a Q-code Super Cobra Jet engine and a 4-speed manual transmission. It was ordered under DSO special order number 750238 and delivered May 22nd to Sanderson Ford in Phoenix, Arizona. Could this be a Rainbow Of Colors car with Madagascar Orange paint? We don't have any records of this special order number or special editions coming out of Phoenix, Arizona. Mark adds,"The car has never been wrecked or rusted and never been painted with 31,000 original Arizona miles. He quit driving the car in 1977 after the last of 6 clutches blew up in the car and it had no more warranty. The original owner is still alive and he told me that he only had the dealer work on the car that explains why all the original smog and everything is still untouched with no hacking what so ever." Wimbledon White 1969 Mustang Mach 1 fastback with a 250hp (5600rpm), 351 cubic inch, 2 barrel, V8 engine. This car also has the highly reflective black Mach 1 side stripes and a matte blacked out hood. Indian Fire Red 1969 Mustang Mach 1 fastback with a 335hp (at 5200rpm), 428 cubic inch, 4 barrel, Cobra Jet V8 engine. Original options on this car include : Cruise-O-Matic automatic transmission, FR70 x 14 Wide Oval radials, power steering, power front disc brakes, fingertip speed control (cruise control operated from the turn-signal stalk), air conditioning, AM radio, and tinted glass. Calypso Coral 1969 Mach 1 Mustang fastback owned by Tom Patterson from Poulsbo Washington. This is our featured Attitude Of The Week for the week starting February 7, 2016. It has the 428-4V Cobra Jet V8 engine and a manual transmission. This was originally a Purple painted Rainbow of Colors promotion Mustang. Tom tells us more, "This Mustang was purchased out of Michigan about a year and half ago. I came with some additional touches making not quite stock. It has a Shelby roll bar installed, 1970 hood locks, and the roof emblems were removed giving it a cleaner look. This car was originally purchased from Russ Davis Ford in Covina, California under the Rainbow of Colors promotion with a color code of WT9106 or Purple." An incredibly well restored Raven Black 1969 Mustang Mach 1 fastback with a matte blacked out hood; hood scoop; hood pins; front air dam; rear spoiler; Mach 1 side stripes and lettering; Magnum 500 wheels; and a 351 cubic inch, 2 barrel, V8 engine. Candy Apple Red 1969 Mustang Mach 1 fastback with a blacked out hood, Magnum 500 wheels, and a 351 cubic inch V8 engine which has been modified with Ram Air induction. The color of this 1969 Mustang Mach 1 is an amazing Pastel Gray with a matte blacked out hood, and white side reflective stripes. This car is not white, take a look at the other photos in this group to see. It also has an M-code, 351 cubic inch, 4 barrel, V8 under the hood which was originally rated at 290hp (at 4800rpm). This is an Aztec Aqua 1969 Mustang Mach-1 fastback. It has the 428ci 4V Cobra Jet Ram Air engine under the hood, the C-6 Cruise-O-Matic automatic transmission, and a 3.25 rear. This Candy Apple Red 1969 Mustang Mach 1 fastback was at the 2010, Port Angeles, Washington, Mustang car show. It has a Q-code, 428ci, Cobra Jet, V8 engine under the hood. This Indian Fire Red 1969 Mustang Mach 1 fastback was at the 2010, Port Angeles, Washington, Mustang car show. This car has the M-code, 351ci, 4V, V8 engine; Magnum 500 wheels, rear spoiler, rear window louvers, side scoops, yellow and black Mach 1 side stripes, grille mounted fog lamps, hood pins, and hood scoop. Take a look at the last photo of this series to see this amazing color in without the rain. This is a Silver Jade 1969 Mustang Mach 1. Its a hard color to take a good photo of. I took this photo at the 2010 Mustang Club of America Grand Nationals in Bellevue, Washington. There is a lot of depth to this color, here is a better photo of the color. Raven Black 1969 Mustang Mach-1 with black side stripes, hood pins, Magnum 500 wheels, and an M-code 351ci 4V V8 engine. This Mach1 was at the MCA Grand Nationals held in Bellevue, Washington. Check out the color on this 1969 Mustang Mach 1 at the 2010 MCA Grand Nationals car show held in the state of Washington. That's Meadowlark Yellow, a light yellow color available for Mustangs in 1969. This car also has a blacked out hood, front air dam/spoiler, rear spoiler, fog lamps, hood pins, and Magnum 500 wheels. Winter Blue with yellow stripe 1969 Mustang Mach 1 fastback. This Mach 1 has a 351ci 4V V8 engine under the hood. I photographed this amazing car at the 2010 Mustang Roundup in Tampa, Florida. This Candyapple Red 1969 Mustang Mach 1 fastback was a the 2010 Mustang Roundup car show in Tampa, Florida. It has yellow/orange Mach 1 side stripes, a 351ci 2V V8 engine, and Magnum 500 wheels. Raven Black 1969 Mustang Mach 1 fastback at the 2010 Mustang Roundup car show held in Tampa, Florida. Ford promotional photo of a 1969 Mustang Mach 1 in what we think is Champagne Gold exterior paint. It has Argent style GT wheels, hood scoop, hood pins, and a blacked-out hood. Photo set of a Gulfstream Aqua 1969 Mach 1 Mustang with blackened hood, hood scoop, hood pins, side scoops, and sport wheels at the 2012 Mustang Roundup car show in Bellevue, Washington. This is our Attitude Of The Week for the week starting July 30th, 2012.